Organic Coconut Oil | Ooh, my favorite! A few years ago, I started transitioning to organic products both in and out of the kitchen. While looking for organic produce and proteins are fairly simple, it is a very different story with health and beauty products. For one, many, many brands claim to be All Natural or Organic, but in reality there are not. Secondly, finding the organic product that’s right for you can be daunting and overwhelming. With on-going help and research with mom we now have a solid arsenal of products that we rely on every day. One of our staples is organic cocnut oil; a wonderful treat for your skin and hair. (I haven’t tried the scalp massage method as my hair tends to be on the oily side, but hope to try one of these Sundays.) With its antioxidant and antibacterial properties, coconut oil not only acts as a great moisturizer but also a remedy for premature aging and various skin conditions. Also available for use in the kitchen, there are other benefits that come from using it in cooking as well. – Available online at Amazon, or from health food stores. Whole Foods has a few different brands to choose from. – I use it at few times a week, but as it’s an oil it’s not always practical to apply it if you shower just before bed. I’d say it takes about 15 minutes to absorb. I know, we’re so far behind. You guys seem way ahead in the naturopathic area. I guess I’m one of those people who’s applying coconut oil on skin and hair. I’ve been doing it for years already and I really love its effect. So good. But, I’m planning to switch to a different brand. 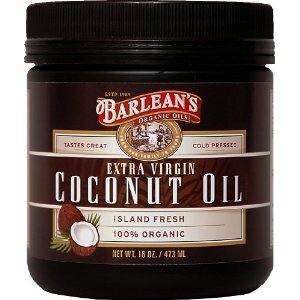 Some of my friends suggest that I try http://products.mercola.com/coconut-oil/ Has anyone ever tried it? This is really interesting. I love the chart helping you choose the right brand. So great, I’m going to research more about this. Thank you for sharing with me. I use coconut oil on everything and cannot get enough of it. I just ran out and don’t know what to do with myself. I’m on a mission to restock tomorrow!